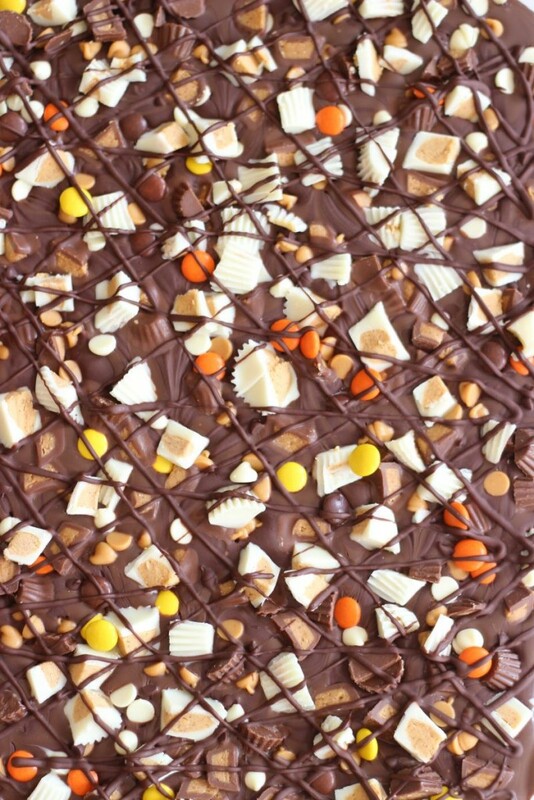 Milk chocolate is melted with peanut butter, swirled with semi-sweet chocolate, and topped with peanut butter chips, white chocolate chips, semi-sweet chocolate chips, and a variety of peanut butter cups! I’ve had candy bark fever this past year! I’ve never been all that enthusiastic about candy bark, or very interested in making it, but I’ve come around. I thought… it’s just a slab of chocolate. What’s so special about that? That’s the precise beauty of chocolate bark though! I love the endless creative possibilities you get with starting a recipe with a blank sheet of melted chocolate as your canvas. 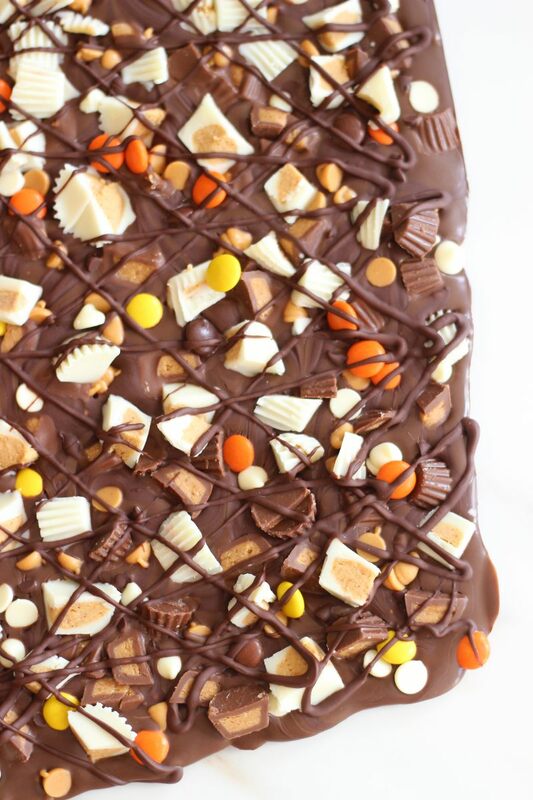 I mean, the entire premise is a huge slab of melted chocolate sprinkled with candy. Sold. 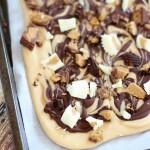 My candy bark fever started when I made this ultra-delicious Tiger Butter. From there, my infatuation snow-balled. 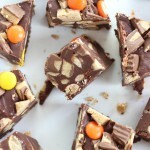 It starts with a slab of melted white chocolate mixed with creamy peanut butter, and is swirled with semi-sweet chocolate, and topped with 3 kinds of Reese’s cups. Did you just die over it? You see how I got sucked into candy bark-making? 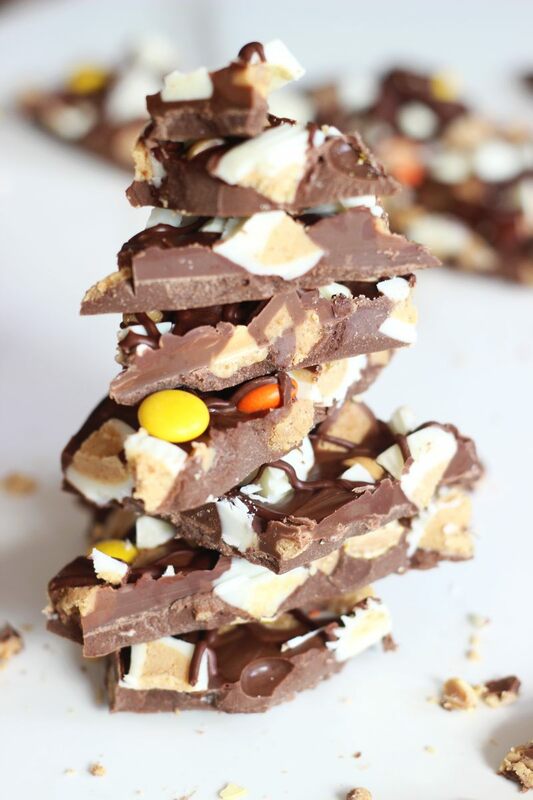 Since the Tiger Butter recipe, I’ve made two different types of Halloween candy barks, the obligatory classic Peppermint Candy Cane Bark for Christmas, and now I’ve made two additional peanut butter-focused candy barks. 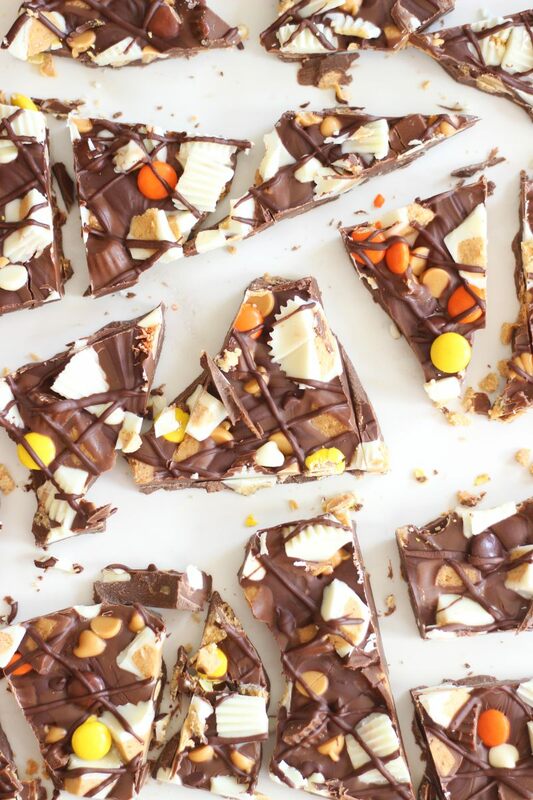 This Triple Chocolate Ultimate Peanut Butter Cup Bark is the first of those peanut butter-focused candy barks. 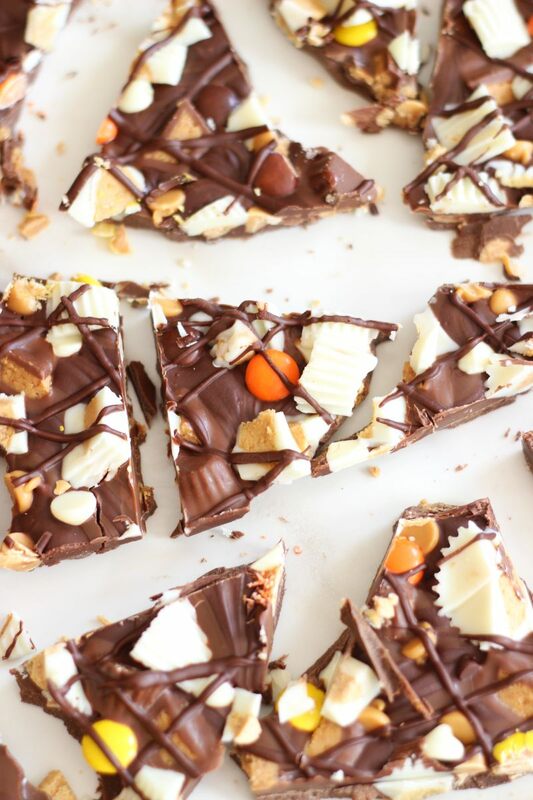 I mixed peanut butter with melted chocolate almond bark so that even your basic slab of chocolate has peanut butter flavor! That’s a MUST. The more PB, the better… obvi. Then I drizzled it with melted semi-sweet chocolate chips, sprinkled it with white chocolate chips, peanut butter chips, Reese’s pieces, mini milk chocolate Reese’s cups, and mini white chocolate Reese’s cups. I don’t think there’s anything else I could’ve done! 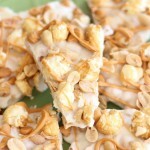 As a peanut butter-lovin’ fool, this bark ties for first place in my book with the Tiger Butter. It’s absolutely packed with peanut butter in many forms, and, as the name suggests, contains three different kinds of chocolate. 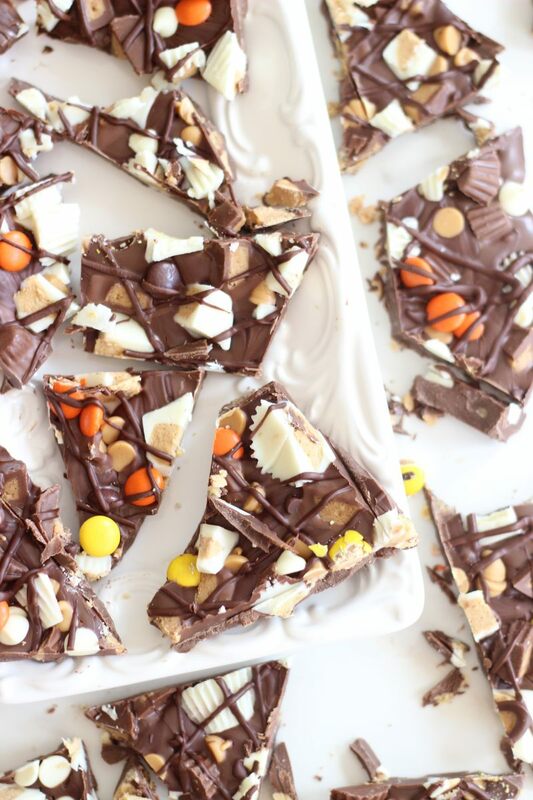 As with most candy barks, this Triple Chocolate Ultimate Peanut Butter Cup Bark recipe takes only minutes to prepare! But before we ate it all, I played candy bark Jenga again. That game is fun. Oh man, this is everything I love in life!! Mostly, peanut butter cups ahha! WOW! This bark sounds incredible. Peanut butter cups are one of my all-time favorite candies, and I just love any dessert that includes them. This is a must try! 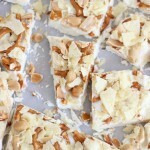 This recipe sounds amazing and it is so pretty too. 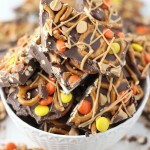 I am obsessed with chocolate bark! And this one in particular…YUM!!! I cant wait to give it a try! 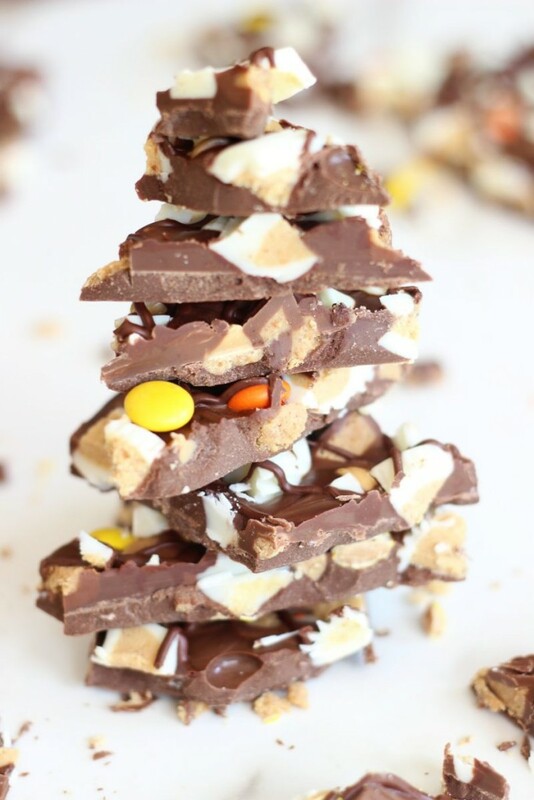 Great way to use up leftover candy (or pick up discount candy after the holidays). Thanks for sharing on the Tasty Tuesdays Linky Party. I hope you’ll join us again. So much yes to this. Pinning now. Oh my goodness, this looks fantastic! It looks like something I saw in a catalog around X-mas for about thirty bucks a pound! Seriously! I just love chocolate and peanut butter! I will seriously eat spoonfuls of PB throughout the day (reduced fat). But triple chocolate and peanut butter together? I’m a goner. Wow that is some deliciously over-the-top bark. A peanut butter + chocolate lovers daydream! Thanks for sharing at #SaucySaturdays.